You will see all of the various themes that are available for your store. To install a theme, simply click on it to open up its respective preview screen. Once you're ready to install the theme, click on the "Install Theme" button. 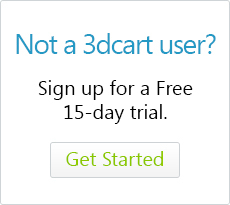 The 3dcart interface will download the theme and you'll be asked if you'd like to apply the template. Clicking OK to this screen will effectively update your site's live theme. Clicking Cancel will merely install the theme without applying it to the live site. Note: The base 3dcart templates are 100% customizable. However, should you ever need to revert to a template completely, you can simply reinstall it from Available Templates to overwrite any changes you may have made prior.